Pure hand made pashmina products are made into shawls and stoles which are again in a variety of types vis-a-vis plain solid colors, woven with silk and embroidered with motifs. Shawls, as favorite pashmina products, are traditional wraps that originate from the Northern Areas of Pakistan, as well as from Nepal. Colorful, classy and a must for any wardrobe. In the North, these are exquisitely embroidered with unique patterns. Shawls are made as wraps, stoles and scarves. Added as fashion accessories, can be worn with traditional Pakistani wear as well as western dresses - adding charm and style to any outfit. These luxurious shawls provide warmth despite their light weight and sleek look. In pure and in silk blends these are ideal for smart western outfits. In solid and rich colors, as well as pastel shades, these add elegance to any dress or suit. The woven types are very stylish to add a dash of patterns on plain ensembles. The patterns cover the entire length of the shawl or stole, in rich or pastel combination. The patterns can be worn on both sides in different color tones. These are made like the Banarsi fabric on looms but with woolen and silk fiber. The most popular patterns are with the classic Kashmiri embroidery - floral and paisley designs and on solid colors. These patterns are also run along the borders. Hand made with intricate designs, these were considered the luxury fashion accessory for the nobility. The most elegant and light yet very warm is the Shahtoosh (Shah Tosh or the fabric/garment/covering of royalty) shawl. 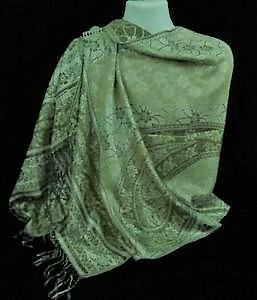 These shawls are beautiful and warm as a plain woven piece or as exquisitely embroidered master pieces. These are very expensive and rare to find. Made from the hair of the Chiru (Tibetan Antelope); this art work had to be banned to save guard the dwindling and endangered specie. 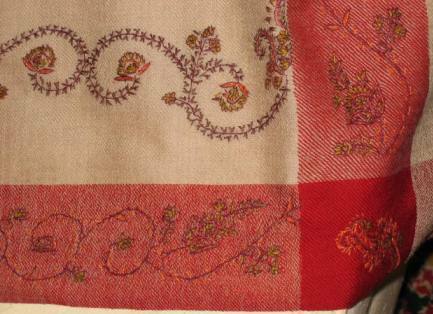 Pashmina shawls and stoles come in various beautiful colours both plain and with embroidered motifs. There are fully embroidered ones, with floral and paisley patterns. 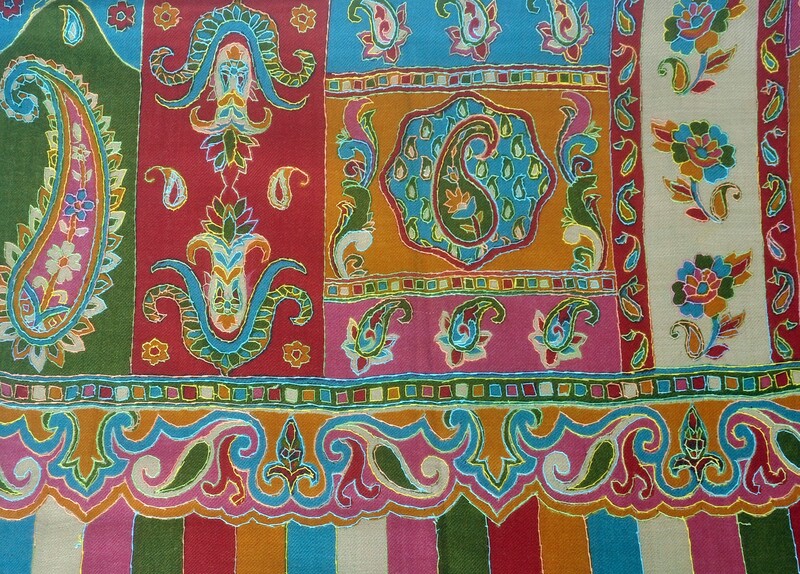 Multicolored patchwork pashmina shawl with full embroidery called Kalamkaar is a unique ethnic piece. Pieces of pure pashmina are joined in different colors and patterns and motifs are embroidered on the edges of the patchwork and in the middle as well. These are exquisitely designed and very high priced pure pashmina products.